What Day Of The Week Is December 2? 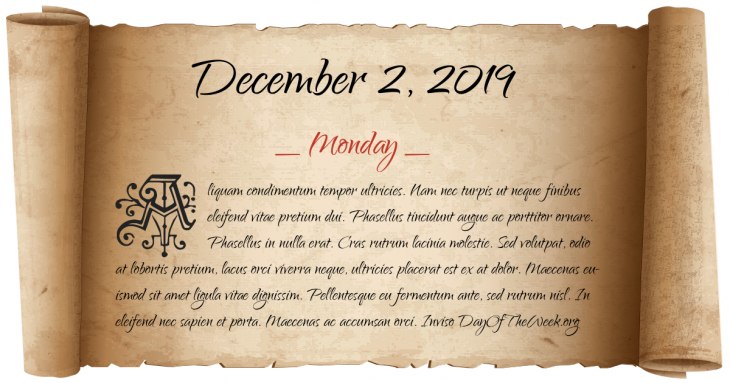 December 2, 2019 is the 336th day of the year 2019 in the Gregorian calendar. There are 29 days remaining until the end of the year. The day of the week is Monday. Louis-Napoléon Bonaparte becomes Emperor of the French (Napoleon III). An armistice is signed between Russia and the Central Powers at Brest-Litovsk and peace talks leading to the Treaty of Brest-Litovsk began. Red Scare: The United States Senate votes 65 to 22 to condemn Joseph McCarthy for “conduct that tends to bring the Senate into dishonor and disrepute”. Vietnam War: After a trip to Vietnam at the request of US President John F. Kennedy, US Senate Majority Leader Mike Mansfield becomes the first American official not to make an optimistic public comment on the war’s progress. Pathet Lao seizes power in Laos, and establishes the Lao People’s Democratic Republic. Enron files for Chapter 11 bankruptcy. Who were born on December 2?